A brand is the way a company presents itself to outsiders: consumers, board members, partners, customers. A brand is used to identify one organization from another. And it’s not just the logo—although that plays a significant part—a brand identity takes into consideration tone of copy, content, visual elements like fonts and images, and even fundamentals like the company’s mission statement. Without a clear brand identity, organizations can sink in the sea of competition. And even if a company has a brand identity, if the ideas that make up that identity only stay with the C-suite or with those in leadership, it’s not being put to good use. An organization’s brand needs to be communicated to all team members. The best way to do that effectively is to develop a brand guideline. Brand guidelines are a set of standards that create a company’s brand. It can be as long or as short as necessary—as long as all the essentials are present so that, as Shelby Clarke puts it, “every single person in your company . . . understand[s] both what the brand is, as well as how to implement it in the work they do.” It can be a physical document or it can live digitally on an organization’s collective drive, so long as every single employee knows how to access the guidelines. Whether your company has 10 employees or 10,000, consistency across all communication is important. Brand guidelines should be readily available resources to anyone within the company to know the correct way to communicate under the brand umbrella. A cohesive communication plan helps consumers and customers identify your company from others in the same space. As stated above, consistency is important to set your organization apart from others in the industry. The voice of your brand is integral to that. A brand guideline can list out preferred vocabulary (“customers” vs “clients” vs “members”), set the tone (“Dear Sir/Madam” vs “Hello friend”), and give examples of copy used on frequent materials (short, to-the-point sentences vs flowery language). Each word used in communication from your brand should exist for a reason. 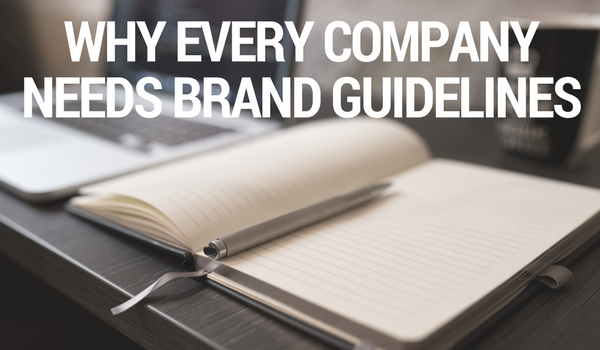 The earlier in your company’s history you create a brand guideline, the better. It will likely change as the company grows, but having a solid foundation of basic brand knowledge can be invaluable for current and future employees. It can keep a record of what styles worked and which needed improvement; it can show how the evolution of your brand led to success. If a brand guideline is established as a clear—and the best—resource for most basic and common queries made about brand communication, then employees can simply refer to the document. Self-reliance creates confidence in knowing that the work they’ve created will fit the brand to a T. If a problem with discrepancy does occur, clarification can be made to the brand guideline document to avoid similar situations in the future. When working with outside vendors—such as marketing agencies or printers—having brand colors and logos will be necessary. Approved colors (in hex, RGB, CMYK, Pantone, etc) found in the brand guidelines can be easily given to vendors, erasing possible ambiguity. A visual representation of how the brand would like the logo to be represented in various forms cuts down on the potential for misrepresentation. Not only does a brand guideline help with internal understanding, but with outside groups who might help create and distribute content. What should I include in brand guidelines? Brand guidelines should include a mixture of visual and written content. It’s not enough to just have logos and colors in the guideline, but tone and fonts as well. A company or organization’s mission statement should be prominently displayed in a brand guideline document. The mission statement is the reason anything else in the book exists and should be the ruler against which every piece of communication is measured—does this fit with our mission statement? If not, it’s time to go back to the drawing board. Throughout a brand guideline, there should be places that explicitly explain or implicitly convey tone and personality. Examples of copy could be when demonstrating ad copy or social media posts or letters to be mailed out to customers. Or an entire section could be devoted to when to use certain terms and which terms to avoid altogether. How can communication across all platforms be consistent while changing the tone to suit the specific platform? The answer to that question should be easy to find. Any time a word is written, it uses a font. Some companies agonize over which fonts portray their personality better while others use standard fonts found in any word processor software. Each font used is a decision that needs to stay consistent across platforms. Maybe one font is only used for blog headers—say that in the guideline. Maybe the website uses the web version of a font, but in print the font should be a similar, but distinct font—that should be in the guideline. Outline in the brand guideline every conceivable circumstance where a deviation from standard fonts would apply, making it easy for users to know which font to use when. If not all computers are equipped with the fonts, make sure to have licensed copies readily available for those who need it. A logo is a brand’s most distinctive mark. More than fonts or images, the logo sets a brand apart from other companies or organizations. As such, you want to make sure that it is given the utmost respect whenever it is in use. Considerations need to be made for how much space to leave around the logo, which backgrounds are appropriate, and if variations in color are necessary. A whole section of a brand guideline should be devoted to the use of the logo, with images depicting what to do and what not to do. Since the brand guideline will most likely be in PDF or print form, make sure to leave a file location for all possible logo files, easily accessible to all employees who might need them. Next to the logo, images are the way your brand sells itself. Each image can tell a story on its own and you want to make sure those images fall in line with the brand. Show what kind of images are appropriate for different kinds of content (ads, blogs, downloads, etc) and discuss why these types of images convey the brand better than others. Also include where users should source their images from; should it be from a free site like Unsplash or a paid site like Getty? How frequently can images be recycled, if at all? Is there a central place to store images so that others can obtain access? Make it as easy as possible for content creators to do their job. Every brand uses specific colors in their logo, on their website, and in their marketing materials. A list of colors should be compiled for the guidelines. Not only the primary colors used in the logo, but also secondary colors used for headers or call-to-action buttons. Each color listed should have a sample swatch, the name of the color, and all possible identifiers, such as hex, RGB, CMYK, and Pantone. If the colors your brand uses aren’t easily found or created, make sure to include substitutes. Guidelines are an important part of presenting the best of a brand to the public. They set out rules, which allow consistency across many content creators and platforms. Guidelines remove possible ambuiguity when creating content or selecting images, allowing content creators to be creative and confident in their work.